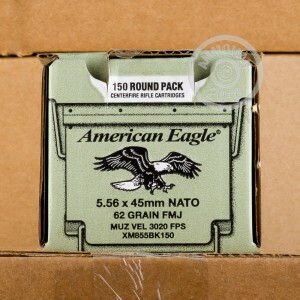 This 5.56 NATO surplus ammunition is manufactured to military specifications at the Lake City Army Ammunition Plant and makes a superb range/target load for AR-15s and other 5.56 NATO rifles. These cartridges follow the M855 standard and fire a heavy 62 grain "green tip" bullet at a muzzle velocity of just over 3,020 feet per second. The bullets are steel-tipped, but have a lead core and a copper jacket. Each lot contains 150 loose packed cartridges. Lake City ammo is highly prized by shooters for its military provenance and consistent quality. It is manufactured using non-corrosive Boxer primers and brass cases (with annealing discoloration left intact in accordance with military standards). 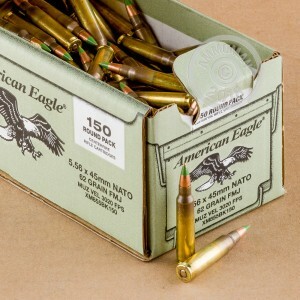 Owners of .223 Remington rifles should make sure that their firearm is capable of handling 5.56 NATO ammo before firing these rounds. 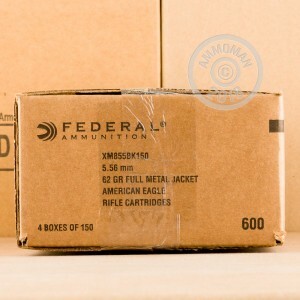 Grab a few bags of this excellent range ammo and earn free shipping from AmmoMan.com! You can order any combination of items totaling $99 or more to qualify.